Its Friday (yippee!) - time for another Steal this Idea* feature - a tiny show of appreciation for a well executed tutorial. Today's know how comes from Tricia Rose of Cabin on the Water. I love how she used a pale gray rather than a bolder color. It adds a subtle texture without taking away from the view out the windows and give its an aged look that wouldn't be possible with most shades. Pretty fabulous right? Check out all the details and tips at her blog. Has anyone done a similar project but with different results? That is a terrific idea for those who really want to do something special with their floors, but can't afford hard wood or recovering them. Love it! I wanna know how she hung those oars! I bought a couple at an antique store and can't seem to figure out how to hang them. The floor is awesome though! lovely and subtle. pale grey is perfect. Turned out beautifully! The mellow colors and large, simple design are perfect. 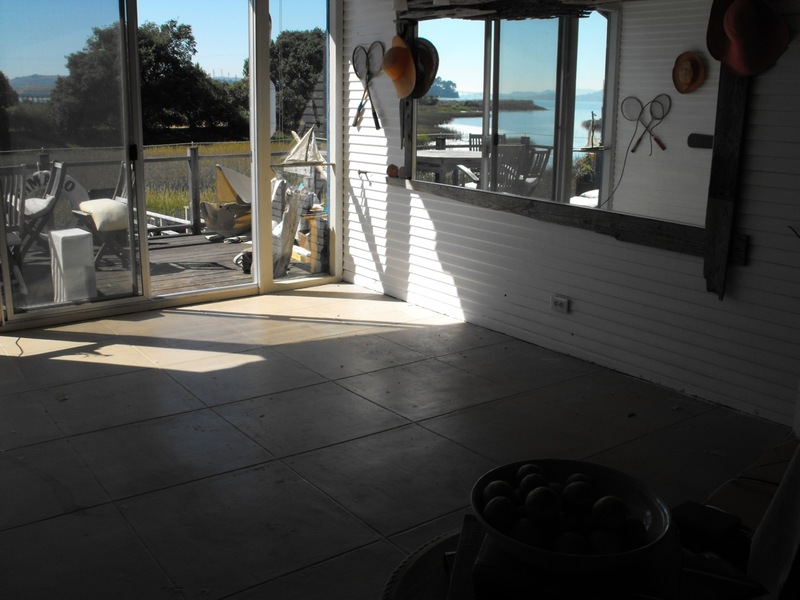 We are desperate to get rid of the ugly gray concrete floor on our screened-in porch, but just haven't been able to fit all new flooring into our budget... this is an AMAZING, inexpensive option. I am bookmarking to do ASAP! Thanks for sharing!! I am looking forward to having a place one day where I can paint on the floor! So many possibilities and she did an amazing job on hers. What a massive porch! I love the grey and pale greycombo too. It looks so restful - just how I'd want my guests to feel when they first came in. and for the other hand painting go here/http://arborhouselane.blogspot.com/2010/04/i-paint-therefore-i-am.html. All of my painting is done by hand no tape involved. I love to paint and I am always looking for new ideas, that is why I love blogging, thanks for sharing. Beautifully done! 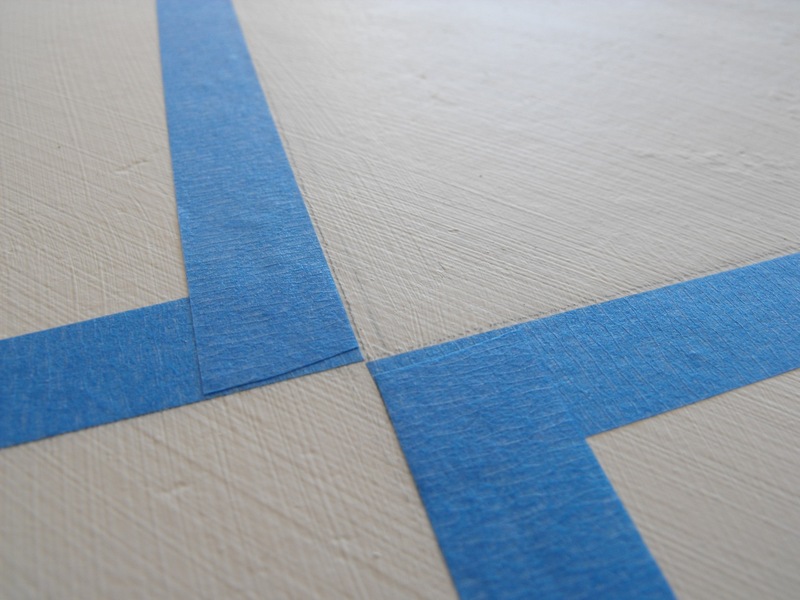 I never seem to get a clean line from painter's tape, I don't know how everyone else does it! I really like this. We have a basment/concrete floor refinish project on our future and this is a great way to add style to a space. I love seeing my child in a costume its so cute and adorable may it be in a princess costume which is very common for young girls, or pig costume makes them look like a huggable stuffed toy! 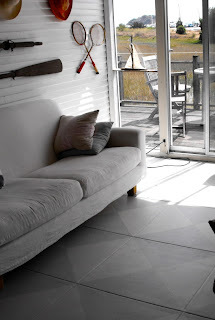 I looove a painted floor -- it makes such an impact when done correctly. The gray tones work beautifully on the floor with punches of color around the room, imho. Cool post!